When it comes to runway collections, many major fashion publications and big-name influencers omit a significant element from their coverage: The fact that they are essentially compensated in exchange for runway show coverage and editorial placement. The editors behind some of the industry’s most prominent and influential publications - and digital presences - are consistently "paid" by brands – by way of vacation-like getaways and expensive gifts – to write runway show reviews, or better yet, to feature brands and their collections in an array of non-traditional advertising formats. While the New York Times, the Wall Street Journal, the Washington Post, and Women's Wear Daily have longstanding policies of not accepting free travel or accommodations for their editors/critics, that is certainly not the norm. On the heels of the recent stagings of the Resort 2017 and couture collections, The Fashion Law takes an exclusive look at the often rampant violations of federal law associated with the industry’s coverage of such runway show events and the larger practices of wrongdoing being perpetrated by fashion publications, editors, journalists, and critics, alike. As we told you in Part I of this series, bloggers consistently run afoul of federal law by failing to disclose sponsored posts and advertisements. However, there are arguably more significant violations at play even further up the fashion totem pole, and they involve some of the industry’s most well-read publications and high trafficked websites, and the industry’s most celebrated design houses. Such ethically and legally questionable tactics are clearly demonstrated in connection with the Resort 2017 and seasonal couture runway shows. The Federal Trade Commission ("FTC") is an independent government agency tasked with promoting consumer protection, and eliminating and preventing anticompetitive business practices. Established in 1914, the FTC garners its investigative and enforcement authority largely as a result of the FTC Act, a federal law that governs the publication of commercial messages and prohibits the utilization of unfair or deceptive acts and practices in the market. Enter: Brands’ Resort/Cruise and Couture collections. The coverage of these special, pre-season shows is often questionable due to deficiencies in journalistic ethic standards and rampant FTC violations in connection with such coverage by an array of the industry’s most prominent publications. Pre-season collections tend to be presented in far-flung locations, and oftentimes, amount to mini-vacations, complete with accommodations, activities, and gifts for attendees. This year, Chanel staged its Resort 2017 show in Cuba. Louis Vuitton in Brazil. Gucci at Westminster Abbey in London, and Dior at Oxfordshire’s Blenheim Palace. Far from merely taking the form of runway shows, these pre-season events, in particular, are often lavish weekend-long affairs, something editors are not necessarily shy to document (in articles and especially on their public personal Instagram accounts). These seasonal trips, and the runway shows that come with them, are routinely documented quite thoroughly on editors’ and influencers’ Instagram accounts. However, what the average individual would not be able to tell from most corresponding show reviews or industry insiders’ Instagram coverage is that the many perks tend to be part of nearly all-expenses-paid weekend-long affairs. This is both ethically and legally problematic. It is also symbolic of a larger problem in the fashion industry. As we learned back in 2014 when Women’s Wear Daily came under fire after its then-employee, David Yi, documented an all-expenses-paid trip to the Maidstone East Hampton courtesy of a PR firm, such trips are commonplace occurrences. While these “press trips” are often documented rather meticulously on Instagram by attendees, they are largely kept under wraps in another way: Their true nature – the fact that brands are often foot the bill for an array of attendees – is almost never disclosed, and thus, such coverage serves to defraud consumers, particularly when coming from individuals and publications charged with providing objective or at least non-deceptive content. Such press trips, when not documented in accordance with the FTC’s guidelines (almost certainly the result of a lack of guidance from the top), leave editors, critics, celebrities, and influencers running afoul of the FTC Act. This is because such coverage stands to significantly mislead consumers. As discussed in Part I of our examination of the industry’s advertising practices, posting endorsements that have come about as a result of a non-obvious connection between the endorser and the underlying brand without proper disclosure amounts to a violation of the FTC Act. The same is true for the posting of quasi-sponsored content, such as press trip coverage (regardless of the medium). Consider Chanel’s Cruise show, which was held in Havana, Cuba last month. Editors from nearly every major fashion publication, including various Vogues, Marie Claire, Interview, Business of Fashion, and Glamour, among others, were in attendance, as were an array of bloggers/influencers were also in attendance. As Chanel’s creative director Karl Lagerfeld told New York Magazine’s Amy Larocca, “We brought 700 people to Havana.” (Notice he did not say, 700 people came to Havana). This is all to say: Chanel (or whatever house’s show is taking place) flies and houses, and wines and dines its guests, including at least some editors and critics, who are then expected to take in the collection in an arguably unbiased manner (as opposed to merely penning a purely sponsored post) a few days later. The same can be said of a number of couture collections, such as Dolce & Gabbana and Fendi, which recently staged shows in Naples and Rome, respectively. As indicated by an array of Instagram photos, the couture shows were similarly extravagant events for editors, critics, bloggers, and clients. Business of Fashion editor at large, Tim Blanks, posted a photo of a Fendi-branded plane, which chartered show-goers to Rome for the show - the corresponding BoF review of the collection does not include a disclosure as to Blanks' travel/accomodations. As for the Dolce & Gabbana Alta Moda show weekend, it was complete with yachts, dinners, and trips to Capri, as indicated by the likes of Vogue International critic Suzy Menkes and editor-at-large for Vogue Japan, Anna Dello Russo. Per Menkes' review, "professional performers, dancing and fireworks added to the entertainment." The widespread “pampering” that McDowell and others describe is problematic for at least two reasons. For one thing, there is the question of how it affects a journalist, editor and/or critic’s objectivity in connection with his/her coverage of the collection. It should be lost on no one that … well, almost no one gave the Chanel Resort 2017 collection a negative review (the same can largely be said for reviews of Chanel’s previous outings in Dubai, Austria, Seoul, etc, and those of its other high fashion friends). For Business of Fashion, Tim Blanks penned: “The designer showed clothes that idealized the essence of cruisewear, something light and pretty to wear in holiday heat and humidity.” Neither of these reviews included disclosures indicating that the critics' travel and lodgings were paid for by Chanel when the "reviews" were first posted. Yes, the reviews of nearly all of the editors/critics in attendance were somewhat uniformly glowing, but how could they not be? A journalist or critic simply must feel at least some sense of obligation to a house (particularly when said house is an advertiser, which is another issue entirely) to skew his review (consciously or otherwise) to an extent, if he has been wined, dined, flown (in first/business class, quite often), housed and showered with pricey gifts by the house. With such knowledge at hand (although most readers/consumers certainly do not possess such insider information), expecting even a reasonably objective review is arguably absurd. This is the ethically problematic aspect. 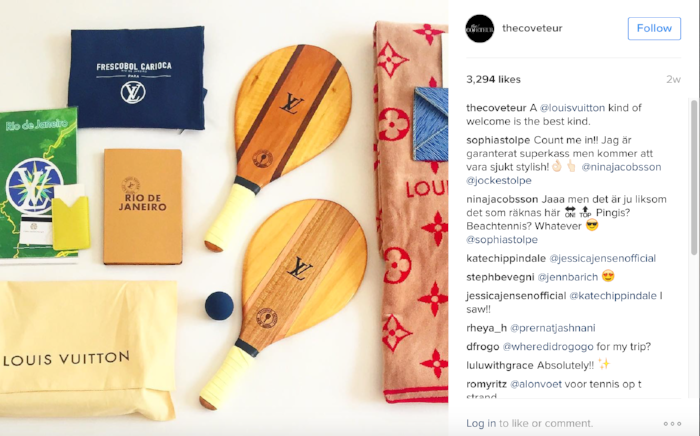 Of the three events [the Louis Vuitton, Christian Dior, and Gucci events], Louis Vuitton's had the greatest reach: Posts tagged with the @LouisVuitton handle reached more than 190 million people over the course of two days; the #LVCruise hashtag was seen by nearly 200 million on show day alone. (There were, of course, plenty of posts that were tagged with both.) By comparison, the #DiorCruise hashtag reached 127 million users, and posts tagged with the @Dior account received 145 million by day two. Gucci came in third: The #GucciCruise17 hashtag reached a little more than 100 million users over two days, and posts tagged @Gucci reached 90 million over the same period. Hashtags have become an important commodity for brands and as a result, it should be of little surprise that they fit quite neatly into the overall scheme being perpetrated within the fashion industry, particularly because brands depend on press coverage. In order to be able to sell goods at a premium – something that is essential in the luxury sector – a fashion brand relies on its reputation. Not merely enticed by quality or design alone, consumers tend to make purchasing decisions based on the offering brand’s reputation, its level of status and exclusivity, and the aura of high fashion and luxury with which it is associated. A high fashion brand, for instance, is not just selling garments and accessories; it is selling a luxury lifestyle based on its quality and its exclusivity. Such virtues and the larger brand identity with which these brands are associated do not blossom overnight. They are built with years, decades – even centuries in some cases – of careful positioning. This is where runway shows and press coverage come in. Like couture collections, which require significant expenditures and derive little return on the garments themselves (but pay off in terms of marketing, at least according to YSL co-founder Pierre Berge), houses are increasingly expending substantial funds on pre-season collections as a means of promulgating brand awareness. Such events allow brands to woo loyal clients in attendance, and to market themselves on a larger scale with the aim of securing prominent review coverage and subsequent editorial placement. And in recent years, such three-day or so extravaganzas have come to result in the added bonus of significant coverage on editors’ social media feeds in a native advertising type of way. This is important, as given the rise of street style blogs and dedicated columns on mainstream fashion sites, editors have become something of celebrities with significant social media followings and even wider-spread influence. The problem: Such advertising – whether it be coverage on Vogue or some of the industry’s most prominent editors’ Instagram accounts – is not packaged in a way that allows consumers to easily identify it as advertising, something the FTC vehemently despises. It is not a coincidence that none of the Resort 2017 or recent couture reviews that came as a result of an editor’s presence at the show (and please note, we are not in any way suggesting that ALL editors in attendance had their trips paid for) clearly indicate that such reviews were made possible almost entirely on Chanel’s dime. As such, this coverage certainly amounts to violations of the FTC Act. How do we know that at least some of the disclosure-less coverage of such runway shows is illegal? Well, the FTC tells us so (in 16 CFR Part 255, Guides Concerning the Use of Endorsements and Testimonials in Advertising). The FTC has provided the public with an array of examples of what it deems to be illegal FTC Act violations, and a few of those examples very closely mirror the situations at hand, a fact that does not bode well for the industry’s largest and most influential publications, their editors, and the brands, alike. One example: According to the FTC, “if [a] motion picture studio approached individuals outside [a movie] theater and offered them free tickets if they would review the movie afterwards” and the arrangement is not “clearly and conspicuously disclosed” in connection with the moviegoers’ reviews, their reviews will be deemed a violation of the FTC Act. If that arrangement sounds vaguely familiar, it should. If we replace moviegoers with Resort show-goers and swap free movie tickets for free plane tickets and hotel rooms, we have a very similar situation – albeit a much more damning one when it comes to Chanel. A college student who has earned a reputation as a video game expert maintains a personal blog where he posts entries about his gaming experiences … The manufacturer of a newly released video game system sends him a free copy of the system and asks him to write about it on his blog. He tests the new gaming system and writes a favorable review. Because his relationship to the advertiser is not inherently obvious, readers are unlikely to know that he has received the video game system free of charge in exchange for his review of the product, and given the value of the video game system, this fact likely would materially affect the credibility they attach to his endorsement. Accordingly, the blogger should clearly and conspicuously disclose that he received the gaming system free of charge. One more bit of rather damning insight from the FTC: “If incentives would materially affect the weight or credibility of [an endorser’s endorsements], they should be clearly and conspicuously disclosed, and the advertiser should take steps to ensure that these disclosures are being provided.” Certainly free trips, free bags, and the like serve as a strong incentive for editors to give good reviews and/or favorable coverage to a brand and its collection. This is especially probable given the fashion industry’s notorious practice of banning editors/critics who publish poor reviews. Thus, such coverage requires disclosure. With this in mind, if editors from your favorite magazines are accepting lavish weekend getaways and expensive gifts from brands in exchange for covering the brands’ collections both at the time of the runway show, itself, and in subsequent editorials, and failing to disclose this, they are acting in direct violation of federal law with significant regularity. There is more to this truly rampant industry-wide practice than just free trips or free bags. Without disclosures indicating that publications are being flown, housed, and wined and dined in connection with their coverage of such collections, consumers are being misled. They are arguably deliberately being deprived of necessary information/context to allow them to weigh the information they are receiving adequately, and this is exactly what the FTC – a consumer protection agency – aims to prevent. While industry insiders know the ins-and-outs of how such shows tend to work, the average consumer certainly does not. The average person does not know that big brands almost always pay for editors’, critics’, bloggers’, and celebrities’ airfare, housing, and other various amenities in exchange for their attendance and promotion (read: non-traditional advertising) of the event and the brand itself. In FTC terms, the influencers (whether they be editors, critics, bloggers, or celebrities) are receiving a form of compensation in exchange for endorsing/promoting the brand. Note: the FTC has made it very clear that compensation is not limited to money; it may take the form of free trips, free clothes, discounts, and likely even borrowed clothing, etc. According to the FTC’s guidelines, “Advertisements or promotional messages are deceptive if they convey to consumers expressly or by implication that they’re independent, impartial, or from a source other than the sponsoring advertiser – in other words, that they’re something other than ads.” With this in mind, the FTC elaborates by holding that “the reason [for disclosures] is obvious: Knowing about a connection [between two parties] is important information for anyone evaluating the endorsement.” And a publication’s coverage of such events is just that: An endorsement. Thus, a large portion of the coverage of the pre-season collections is running afoul of the law. In terms of coverage of the #LVCruise show, none of the major publications or editors in attendance disclosed their connections with the brand (read: their free trips, etc.) in conjunction with their coverage of the runway show/collection. In order for such editors and co. to avoid potential FTC liability, they are legally obligated to disclose their connection with the brand. #Sponsored seems like a fitting disclosure for social media posts. A disclaimer to the effect of, “Chanel provided all accommodations in connection with [insert publication name]’s coverage of the Resort 2017 collection” or some variation thereof likely works for articles and reviews. You will notice that none of the reviews for any of pre-season collections include any form of disclosure. *UPDATED: BoF updated its Chanel/Cuba review to include a retroactive - and without note of correction - disclosure that Tim Blanks attended as a "guest of Chanel." A number of other reviews on its site for which editors were "guests" of the brands remain undisclosed, including the review of Fendi's Fall 2016 couture show review.